Digital distribution and expansion packs have been around for a surprisingly long time: the Atari 2600’s GameLine (1983) let people download games via their phone lines, while the Genesis’ SegaChannel (1994) offered a subscription to play games through cable lines, like dial-up proto-xbox-live. Total Annihilation (1997) was the first PC game to gain an expansion pack. Like many gaming nerds, I don’t have a problem with DLC, Expansion Packs, or even freemium games. The part I have a problem with is when it seems like developers and marketers are designing a game based on what suits their pockets rather than their players.Sometimes, these things work pretty well together. Joke DLC’s like Skyrim’s Horse Armour and services like the Xbox Live Avatar Marketplace are technically completely useless. However, they are entirely optional, and the players who spend money on these things are providing money that can be used to develop other servives for lower-cost. Voluntary money sinks designed purely for fun aren’t my thing, but they have a purpose and a fanbase. Games designed in an exploitative way, lying about their “play for free” status, or using psychological maniuplation to make people feel like they have to pay in order to maintain their progress? That’s where profit overtakes propriety, and that’s where the negativity should be aimed. Microtransactions are a newer avenue of digital distribution. In a sense, they are a logical extension of expansion packs- if someone only wants more of one specific aspect of the game, it is more efficient to offer every available extra separately, so people can choose what parts of the game they want more of. This idea itself isn’t problematic, but the culture of microtransactions and freemium gaming grew so rapidly due to the influx of social media games and mobile games that it raced ahead of its critics. Trying to regulate what is fair in freemium is like trying to safety-check fireworks on Bonfire Night- there’s no way everything can be checked in time. A typical freemium mobile game will have various different purchasing options, from new levels and characters, to power-ups and boosts, to purely cosmetic items. Oddly, looking at the purchase screen will often reveal a lot of illogical options, that you don’t really expect anyone will ever buy. However, these are usually set up very cleverly, deliberately including inefficient choices for their psychological effect rather than their monetary value. This is done for a few reasons: Making the cheapest choice inefficiently small means players are more likely to focus on the second- or third-cheapest choice straight away. This holds true even when a player initially intended to buy only the cheapest choice. Beginning with the non-cheapest choice, in the name of cost saving, reduces the psychological barrier of picking more expensive choices. This makes it easier for players to be further tempted up the pay scale, considering items they would normally bypass, a persuasive psychological tactic known as the foot-in-the-door effect. Similarly, including one unthinkably expensive pack paints other choices as much more reasonable. Someone opposed to a £5 DLC in a game where £5 is the peak is more likely to buy a £5 pack in a different game where the other options can reach >£50. Setting items up as collectible, or part of a set, encourages a desire to complete the set. The Ziegarnik effect says that incomplete tasks or challenges will remain more strongly in the mind than completed ones. This is especially true for people with a high need for achievement, who gain most satisfaction from completing tasks. As gamers, we’re pretty good at needing achievement, so you can see why this effect is a goldmine for marketers to tap in to. (Another permutation of this effect will be the main focus of the next post- for this one, I’m concentrating on the Collections aspect). Finally, DLCs can also encourage increased spending by using a mixture of permanent and transient unlocks. For example, new weapons or vehicles (permanent) can be associated with a time-limited levelling rate increase for the new item, or a temporary overall xp gain (transient). After all, the best time for someone to buy a boost item is when they’ve just unlocked something new that guarantees they’ll be spending time playing. When the time-limited effect wears off, the game can then advertise an item that removes the cooldown for it; a financial triple-tag-team effect. The game in focus today is Asphalt 8: Airborne, a freemium arcade racer published by Gameloft. A8 somehow manages to do every single practice on this list, which makes it pretty useful for analysing here. Firstly, let’s look at A8’s DLC offerings. The first noticeable option is 9 Class D cars (the lowest in the game) for £1.49. Only the first few races of season 1 are Class D, so there isn’t reason to spend much time on these cars. At this price, the focus is purely on being a timesaver- £1.49 will unlock all the “boring” low-levelled cars, leaving you free to play on the higher-level cars. Because of this, the 10-car Class C pack (£3.49) looks like a good deal, as they will provide more fun than the Class D cars. This almost makes them more appealing than if they had been the cheapest option, as there is something worse to compare them against. The Starter Pack (one car from each class, £3.49) gives the impression of being a shortcut to jumping in to higher-level races. This one is both saving time and increasing perceived investment in the game, so is doubly appealing. So, if you’ve already bought a £3.49 pack, you don’t have a reason to deny getting the other £3.49 pack next time. Then, if you’ve got both £3.49 packs, the £7.49 pack isn’t as much of a psychological jump as it would be if you had only got the £1.49 pack at the start. Cleverly done, as it gradually pushes the edges of what players find it logical to spend, without forcing them to get the more expensive packs. Above that, we have 2 maxed-out Class S cars, at £79.99. No, that’s not a mistype. No-one may even be expected to actually buy it. But after you’ve picked your jaw up off the floor reading £79.99, the £15 Class A pack now looks almost sensible in comparison. The main danger with packs this expensive is that they’re still unexpected. For casual gamers, the idea of spending >£50 on the game they’re playing, even having the option of buying something in-game for >£50 is unthinkable. It would be pretty easy for someone to misread the A8 pack thinking it said £7.99, then have to face a surprising phone bill. It’s not even the worst offender I’ve come across. Barring social experiments such as the Curiosity Diamond Pickaxe (£50,000), or experiences of a lifetime that are connected to a game (Saint’s Row IV’s Milliion Dollar Pack $1,000,000), there are still a few triple-digit DLC’s in existence. Forza Motorsport 5 has been repeatedly criticised for using freemium tactics in a retail game, culminating in a single car that costs £60. 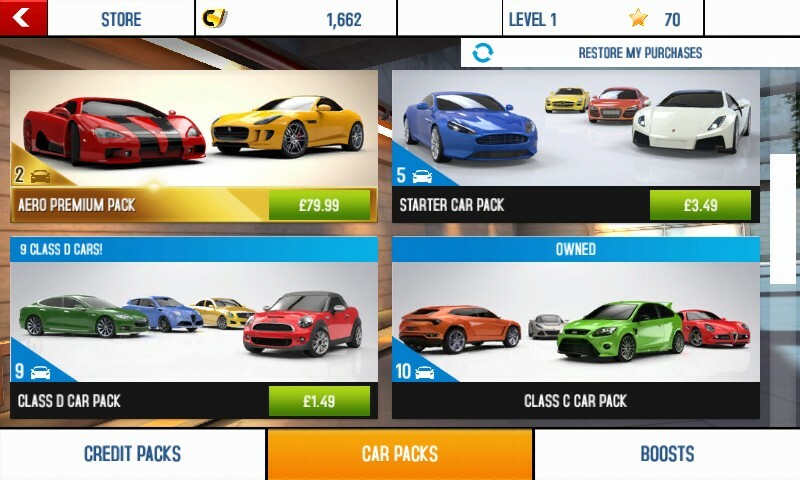 Mobile racing game Real Racing 3 featured a £70 single car pack, and others have brought in mega-packs of in-game currency reaching over £100. Back to the respective sanity of A8, I think. Another reason to buy more cars is that Class-C and above races often require the use of a specific car, and/or a specific car ability rating. Getting these means either playing a lot, buying new cars, or paying to boost or upgrade. This goes back to the transient/permanent pairing mentioned earlier- new cars are permanent, as are upgrades, but boosts are temporary. This encourages people to buy both new items to enter the race and boosts to win it. A8, as part of a series of mobile freemium games, isn’t a typical “mobile port converted to free-to-play” game. It’s been built freemium from the ground up, and the options to buy your way to victory permeate it so thoroughly that it makes it less of a game. As you’ll see next post, I’ll be coming back to this game because it does everything on the freemium checklist in a lot of other areas too. If A8 wasn’t freemium, it would be basically be mobile Burnout, and that would have been amazing. Instead, its significant entertainment value is spoiled by the knowledge that its never quite a fair game- however well you do, you would do better if you spent more money on it.